Optimizing your website images is a smart way to make your website’s page load more quickly and at the same time save bandwidth consumption and obviously, your hosting bills. Many tools for optimizing your website images are present out there for free but not all of them are really good to use. Here is a list of 8 tools that are easy to use and quite handy, and which let you shrink your images as much as you want. smush.it! is an image optimizing tool that was created by Stoyan Stefanov and Nicole Sullivan. It is available as a Firefox extension, a bookmarklet, or as a simple web-based app (hosted by Yahoo!). It supports a lot of formats and even converts GIFs to PNGs all by itself. NOTE: GIFs and PNGs are virtually the same, but PNGs takes very small space. RIOT is short for Radical Image Optimization Tool. 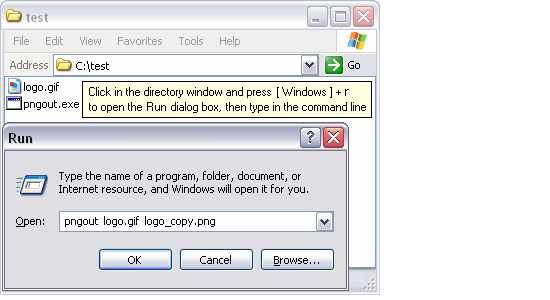 It is an image optimizing tool for Windows users and is available as a standalone app or as an extension of IrfanView. It supports JPG, PNG, and GIF formats and can remove image metadata for decreasing the file size even more. It also has some basic image optimizing features like pan, zoom, and rotate, and flip built in. PNGOUT was created by game programmer Ken Silverman. It is a free tool that is very handy. It rums in the command-line or Windows Run dialog box. It supports JPG, GIF, and PNG formats. It has a lot of options that let you customize the way your files are compressed. 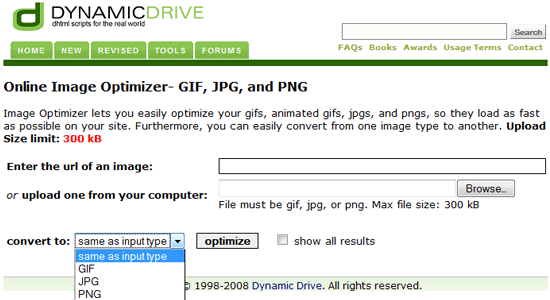 As the name suggests, Online Image Optimizer from Dynamic Drive is a web-based tool that lets you compress your images. You can give the link of the image to be optimized or upload it from your PC. You can also choose what output should the image be in (the default is the same file type as the input). 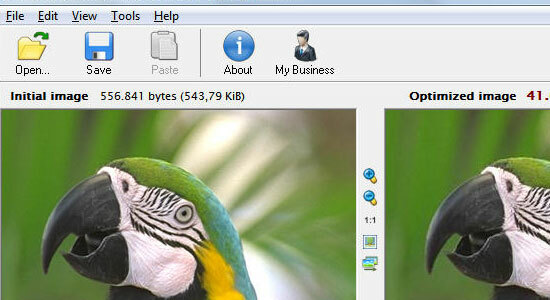 The only downer is that this tool does not take images bigger than 300 KB. As you must have guessed, SuperGIFis a tool that lets you optimize your GIF images. It is a free tool for Windows and Mac OS users. The interface of this tool is really easy-to-use and allows you to do drag and drop interaction and has the ability to compress GIFs 50% more in some instances. The free version has the limit of compressing one GIF at a time but all other features are exactly like the commercial version, which costs $29.95, except batch processing. PNGGauntlet is a .NET GUI app for PNGOUT. It can be used for converting JPG, GIF, TGA, PCX, and BMP to highly optimized PNG files. This is a great tool for those people who do not like working in the command-line/Windows Run dialog box, but still wish to take advantage of PNGOUT’s superior optimization algorithm. You can go to PNGGauntlet’s FAQ page or its forum for help if you encounter some trouble using it. This tool is free and GPL-licensed Mac OS utility that allows you to crush your PNG files to tiny sizes. The interface is quite simple and easy to use. It also boasts the drag-and-drop feature that lets you drag one or more PNG file into it, compress it and preserve the original file so that you can compare the size difference. The creator of this tool says that it is best used on PNG-24 files. This one is a free Photoshop plugin that lets you save significantly smaller PNG files as compared to Photoshop’s native saving feature for PNG’s. It also boasts some other advanced features to create PNG files, like 16-bit color support, variable compression, gamma correction, and metadata saving. If you want you can view some PNG samples saved by SuperPNG in the PNG Samples page. 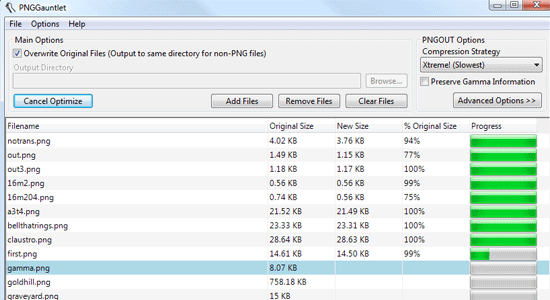 PunyPNG provides makes a night and day difference in the total payload of images. Image quality cannot be sacrificed today and PunyPNG helps make sure that we are fully optimized, without compromising user experience. What is your favorite image optimization tool? Share with us your favourite image optimization tool in comments below and let us know why it is your favourite!